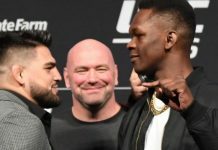 A key middleweight scrap between former division champion Chris Weidman and surging contender Kelvin Gastelum served as the main event of tonight’s UFC on FOX 25 fight card from Long Island, New York. Round one begins and Weidman looks absolutely huge compared to Kelvin. Gastelum takes the center of the octagon. Weidman throws a high kick but it is blocked with ease by Kelvin. 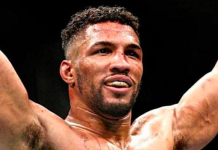 A straight right hand finds a home for Weidman. He follows that up with a front kick to the body. Gastelum with a left hook that misses and Weidman scores a nice right hand. Chris shoots in and scores an easy takedown. He works a couple of short shots before Kelvin stands back up. Weidman drags Kelvin back to the floor and winds up in side control. Weidman begins working for a kimura but when he tries to extend the arm Kelvin is able to scramble back up to his feet. Kelvin partially lands a head kick. He seems to have gained some confidence now. He lands a right hook and then a straight left that floors Weidman. He hops on him with ground and pound before the horn sounds to end round one. 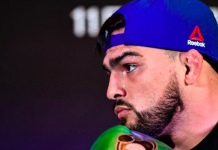 Round two begins and Gastelum presses the action early. Weidman responds with a low kick and then shoots in for a takedown attempt. He doesn’t get Gastelum to the ground but is able to press him against the cage. Wediman finally secures the takedown and immediately moves to the back of Kelvin. Gastelum scrambles back up to his feet but Weidman quickly drags him back down. 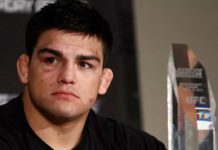 Again Gastelum gets back to his feet. Weidman continues to work for the takedown and gets another. Chris is working from full guard now. He lands a nice right hand from the top. Weidman with a nice elbow and then another. Gastelum is doing a good job of limiting Weidman’s offense here. Round two comes to an end. Round three begins and Kelvin comes out swinging. He lands a right and then a left. Weidman connects with a right of his own and Kelvin briefly drops. He’s back up and lands a right. Weidman with a kick and then a right hand. Another right hand and Kelvin might be hurt. 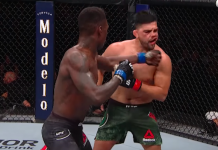 Gastelum with a jab but Weidman answers with a knee. Chris shoots in for a takedown but Kelvin scrambles free. Weidman presses Kelvin against the cage and scores a double leg. Kelvin quickly stands back up but Chris is still on his back. Weidman drags him back to the floor and away from the cage. 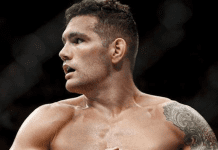 Weidman is looking to take Gastelum’s back. He switches to an arm-triangle choke. He locks it in. Kelvin is forced to tap.